You know the usual thoughts that pop up in the back of your mind when you hear the latest weather forecast with calls for a major storm coming through. You wonder whether you’ll be able to get to work on time when a blizzard hits. You think just how awful everyone’s driving will become when a huge storm is on its way. Events like this present a great inconvenience, especially when leaving your house becomes dangerous. That’s why we created this article. We wanted to provide you with guidance on how to best prepare yourself when disaster strikes. Need to stock up on some important survival gear? Check out our list of 11 important survival gear items. Below you will find the top 5 foods to stockpile when you think there may come a time when you need them most. Whether it be a natural disaster, a terrorist attack, or any other unplanned event, it is always important to be prepared. Take a peek at our best survival foods list below and stock up on these the next time you make a trip to the grocery store. Pinto, kidney, lima beans, and lentils can all be kept on hand as a good way to stay full while maintaining a good amount of nourishment. If unopened, beans can last you up to 8 or 9 years. That’s quite a long time and it certainly cuts into the amount of time you have to go to the grocery store! 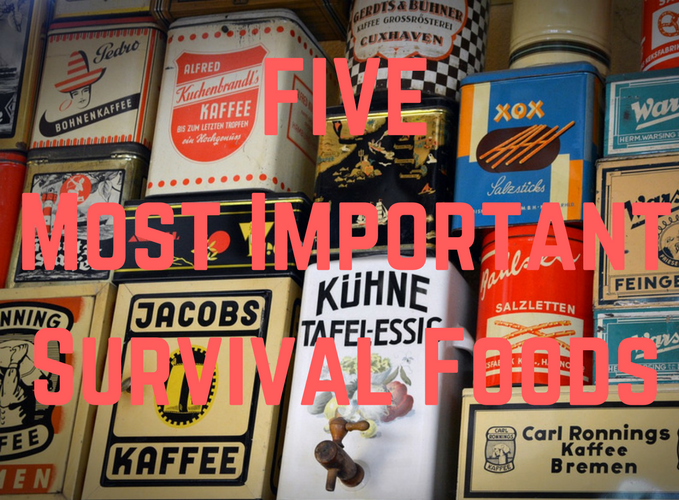 All of the best survival foods, outlined here, are meant to last for years and years which can be highly convenient in an emergency situation. If you are looking to feed lots of people and need a great affordable option, look no further than beans. Canned meat is yet another amazing food to keep you full when times are tough. Canned meats should be considered necessary for outdoor excursions and when you can expect weather to keep you locked in the house for a few days. Try to buy canned foods such as tuna, spam, chicken, or ham. Expect these to last at least 3-5 years. When disaster strikes, you need food that provides proper nourishment. Naturally, canned tuna or chicken does just that and provides you with essential sustenance to keep you going. One thing to keep in mind, you must be willing to eat them cold especially if your electricity is out. That being said, I doubt that will be an issue when the weather goes awry and you are scrambling. The best survival foods are ones that give you sustenance and keep you operating at a high level; not necessarily foods that provide you a five-star meal. Rice feeds millions of people around the world every single day. It is something simple to prepare and store while providing valuable nourishment. It’s no wonder it’s the staple of many daily diets around the globe. Rice is extremely affordable and has fantastic sustenance. I have included rice on this survival food list because those on a budget can expect to get the most out of this grain. Rice is versatile and very tasty with the canned meats listed above. It can be kept on a shelf for only around 6 months. So, keep that in mind when picking items for your disaster food list. This may seem like only a short while, but I have found that rationing it can be quite simple. Not much rice is needed to feed a human being adequately, and hopefully when you find yourself in a survival situation it won’t be anywhere near 6 months long. Rice is delicious and can be used with just about anything. I usually try and remember every few months to eat the stored amounts and restock our bags. When stored properly, you can expect dried fruits and vegetables to be some of the most long-lasting food items around. Produce is something that is obviously unrealistic to have as a basic survival food as its regular shelf life is too short and proves to be too expensive to buy in large quantities. However, you can expect to get 10 years or more from dried fruits and vegetables. You can very easily find dried apples, carrots, onions, apricots, dates, bananas, corn, and much more at your local supermarket. Be sure to purchase them in bulk. Try to keep dried fruits and vegetables at a constant temperature to increase their shelf life to close to 20 years. Yeah, that’s right, I said 20 years! Finally, we have powdered milk. This is an especially important survival food because it caps off the nutritional bases that should be covered in survival mode. Powdered milk can last about 10 years. It can be used in a variety of ways besides drinking it. If you decide to include oatmeal or fiber-rich cereals to your survival backpack, you can use the milk to add more nutritional value. Powdered milk can also be used with certain soups, to make yogurt and even sour cream. It is yet another food item that has been made more convenient for difficult situations where liquid milk which is not available and only lasts for about a month or so. Survivalists and outdoorsmen alike have made great use of food such as dry milk and you are encouraged to have it on hand for when you need it most. What Are The Best Foods for Staying Alive? Many of us do not consider our access to foods when we have it and only realize its importance when we don’t. When we find ourselves in precocious conditions where access is limited, we must be able to cope with the foods we have on hand in the event of an emergency. Do not be afraid to start stocking up early. Buy large quantities and research nutritious foods that can be eaten without the use of modern electrical appliances. Foods like these outlined above, that don’t need a microwave or electricity, can be life saving for those who are put in the worst of situations. When a massive hurricane hits and your stranded for days on end without power what do you do? It’s for this reason that we implore you to have some survival foods on hand to keep you and your family safe and protected. Get yourself protected! Check out the article on the must have survival gear in 2017! Pemmican is easy to make, tastes delicious, lasts for years without refrigeration, highly rich in nourishment and easy to transport. There are many recipes on the internet. Awesome, thanks so much Meathead for your input. We really love your site, it has unique information, Thanks.